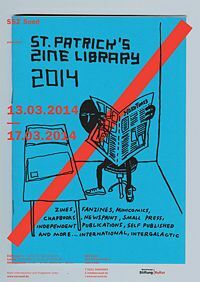 St. Patrick's Zine Library - ZineWiki - the history and culture of zines, independent media and the small press. The St. Patrick's Zine Library is a "traveling" zine library with no official permanent residence for the collection. The library pops up on different locations, "to save the kids from the forces of evil" (as stated on a flyer/invitation card). Originally the library opened at least every 17th of March (St. Patrick's Day) on a different location. The collection was compiled and is maintained by Cologne based artist Patrick Rieve. Associated projects: Patrick's Zine Distro and the Yin Yang Yong Collective respectively Yin Yang Yong Publishing. In 2014 the collection was displayed at SSZ-Sued, an small exhibition space in Cologne, Germany. Starting March 13th there was a presentation or zine launch with new zines by Missis Nasti aka Franziska Nast, Torben Röse, Marco Zumbé, Tom Krol, Stalker Evans, TFGC Publishing and TBOOKS COLOGNE. On friday there was a reading with zinister Al Burian (Burn Collector), as well as a library introduction with Victoria Neuman on Sunday 16th. In March 2016 the library was open at The Millionaires Club, a 3-day Comics, Posters, and Graphics festival held in Leipzig. 1st of May 2016 the collection appeared as part of Raymond Pettibon's exhibition Homo Americanus at Deichtorhallen Hamburg/Sammlung Falckenberg in Hamburg. The collection is international (sometimes discribed as intergalactic). Among zines, fanzines, minicomics, newsprints and other small press publications the library hosts a "motley crew" of zines produced by young people, sometimes related to workshops held by artists, writers and/or zinisters at schools or other facilities or as a private event. These publications are predominantly in German or English language. This page was last modified on 26 December 2018, at 13:51. This page has been accessed 31,241 times.